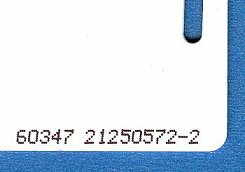 If you need to know the format, facility code or serial number of your HID or Indala proximity cards, please take a working card sample and provide us with the XXXXXXXX-X number printed near the card´s corner (see example photo of an HID ProxCard II). We will use this info to check the HID database and locate the format and facility code for you. For security reasons, we will provide this info only to card owners, belonging to established companies or institutions. Company e-mail addresses only- no free email (Yahoo!, Hotmail, Gmail...) requests. Payment will be reimbursed as a USD$25 coupon to use towards your HID or Indala card purchase in our store.